Summary: The year was 1765. Eminent botanist Philibert Commerson had just been appointed to a grand new expedition: the first French circumnavigation of the world. As the ships’ official naturalist, Commerson would seek out resources—medicines, spices, timber, food—that could give the French an edge in the ever-accelerating race for empire. I should start this review by stating that I rarely read nonfiction books. 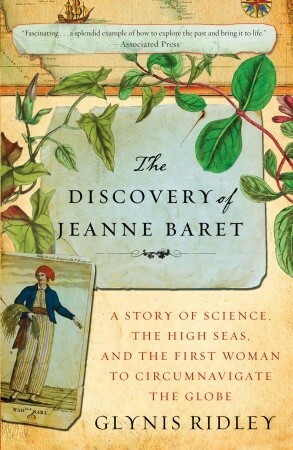 I almost always pass them right to Booking Pap Pap, but THE DISCOVERY OF JEANNE BARET: STORY OF SCIENCE, THE HIGH SEAS, AND THE FIRST WOMAN TO CIRCUMNAVIGATE THE GLOBE by Glynis Ridley appealed to me. Maybe it was the book's description about a woman who impersonated a man so she could sneak on a ship and collect botanical samples from around the world... in the 1760s. However, I think it's mostly that the pitch I received from the publisher was just too darn good to pass up. His excitement over this story really came through in his email. I guess my major issue with this book is that it was very fact-based and filled with tons of details about Ms. Baret's life and times. Most of you are probably saying, "Well, isn't that what you'd expect?" And you're absolutely right! However, where the book got a little tedious to me wasn't in the parts about her life as much as it was in the parts about the science of the times. When I look back at the novel, I was very interested in learning about the challenges Ms. Baret faced, and I thought the descriptions of her life aboard the ship were fascinating. I just admit that I'm not that interested in botany. I am the first to tell you that I'm probably not the best judge of quality history books; however, I think THE DISCOVERY OF JEANNE BARET is one. This book is extremely well written and I thought Ms. Ridley did a great job of presenting Ms. Baret's story. Furthermore, the author did a remarkable job of researching this subject. That's evident in the amount of details she provided not only about Ms. Baret, but also about the condition of the world in the mid 1700s. Ms. Ridley also managed to present some entirely new ideas about Ms. Baret's life, and she should be commended for sharing this heroine's story with readers. BARET, I did find the second half of the book to be quite interesting. I am definitely glad that I learned about Ms. Baret's fascinating story. Recommend for fans of history and/or science books. I love to read stories about women in history who got away with impersonating themselves as men. Because you have to wonder about going to the bathroom, showers, etc! I'm not much interested in botany either, but this book sounds very interesting. I don't mind lots of historical details, so long as the book isn't dry. Doesn't sound like my kind of book either, but thank you for the review! My mother would probably enjoy this book, but I'm probably not smart enough for it either. I agree that it was a little dry. I also thought the author made a lot of assumptions about what Baret was thinking/feeling and I didn't necessarily agree with all of her conclusions. i got pulled into accepting this book too by the publicist's pitch! i'm more than half way through it, but i've put it aside for now to give my brain a rest. i don't think i'm smart enough for the book either and i was a biology minor in undergrad! =[ i'm glad i'm not alone though. i was starting to feel terrible that i would have to write a less than stellar review of the book.